The aim of this study was to estimate the expression of androgen receptors (ARs) in patients with estrogen receptor (ER)-negative breast cancer. Growth of breast cancer is hormone dependent. Estrogen and progesterone play a fundamental role in the pathogenesis and treatment of patients with ER-positive breast cancer and those with progesterone receptor-positive breast cancer. Patients who lack the expression of these receptors receive no benefit from hormonal treatment and are considered to have a poor prognosis. AR is a member of nuclear steroid receptors with ambiguous role in patients with breast cancer. There is growing evidence about its prognostic and predictive value in patients with breast cancer. This study included 56 patients who presented to Department of Clinical Oncology, Menoufia University, between January 2012 and December 2014. We included patients with pathologically proven invasive breast cancer and negatively expressing ER. Immunohistochemical study was done to evaluate the expression of AR using paraffin-embedded formalin-fixed tissue sections. 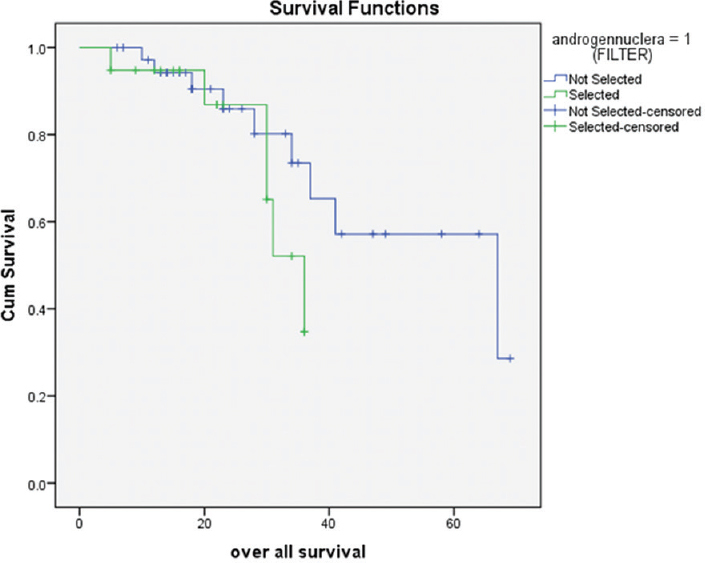 Data were collected regarding clinicopathological characteristics, treatment modalities, and survival analysis including progression-free survival and overall survival. AR was expressed in 34% of patients and was correlated with advanced axillary nodal involvement and human epidermal growth factor receptor overexpression. It has a poor effect on overall survival in patients with triple-negative breast cancer and good effect on patients with ER-negative human epidermal growth factor receptor-positive disease. AR is a possible prognostic factor in breast cancer. Patients with triple-negative breast cancer could be classified into those with AR-negative disease and AR-positive disease. Steroid hormones play a fundamental role in growth and development of breast cancer . The critical role of estrogen receptor (ER) and progesterone receptor (PR) in the pathogenesis of breast cancer is well recognized, and both are considered important in regulating cell proliferation and differentiation in patients with hormone receptor-positive disease. The expression of ER, in particular, is thought to have an important predictive value, predicting an ~50–75% response rate to hormonal therapy. ER-positivity is also prognostic of delayed recurrence in primary breast cancer. The data concerning PR are not as clear as those of ER, but ER-negative and PR-positive tumors are thought to have an intermediate response rate compared with ER-negative and PR-negative tumors . Triple-negative breast cancer (TNBC) subtype still lacks targeted treatment options with the exception of clinical interest in poly (ADP-ribose) polymerase  inhibitors . Chemotherapy remains, therefore, the standard of care for those in need of systemic treatment. Several trials have been done to identify possible therapeutic targets for this category of patients in an attempt to improve treatment outcomes. One example is androgen receptor (AR), which is a member of the steroid hormone receptor family with structural similarity to ER and PR, but the role of AR in breast tumorigenesis remains largely unexplored . Preclinical studies suggest that the action of androgens is bidirectional: mainly proliferative, because circulating androgens are the precursors of estrogens, but also antiproliferative activity, as was noticed and explained through its role in inhibition of ER activity . It has been also reported that its prognostic and predictive value differs among different molecular subtypes . The purpose of the present study was to analyze the expression of AR in paraffin-fixed tissues in a subset of patients with predominantly ER-negative tumors from Menoufia University Hospital and to correlate AR expression with other prognostic variables as well as clinical and pathologic data. The study protocol was approved by the ethical committee of the college & a written consent was obtained from each participant. We carried out a retrospective study that was done in accordance with the ethical standards of the Declaration of Helsinki. An ethical approval was obtained from the ethical committee at the Faculty of Medicine, Menoufia University. In this study, we included patients with ER-negative breast cancer who presented to the Clinical Oncology Department, Menoufia University, between January 2012 and December 2014. Clinical and pathological data were obtained from medical records at the Clinical Oncology Department. ER, PR, and human epidermal growth factor receptor 2 (HER2) status was available from pathology reports. All breast cancer core biopsies were histopathologically reviewed on hematoxylin and eosin-stained sections. Formalin-fixed and paraffin-embedded surgical specimens were tested for AR expression. Immunohistochemical studies were performed using streptavidin–biotin method. The AR antibody was purchased from Lab Vision, Cambridge, UK (kit no. 1124). AR Ab-1 (clone AR441) mouse monoclonal antibody of immunoglobulin type (Lab Vision) was used with dilution ration of 1:50. A semiquantitative H-score like method was used that details the percentage of cells showing no, weak, moderate, or strong staining. The score is given as the sum of the percent staining multiplied by an ordinal value corresponding to the intensity level (0 = none, 1 = weak, 2 = moderate, and 3 = strong). With four intensity levels, the resulting score ranges from 0 (no staining in the tumor) to 300 (diffuse strong staining of the tumor). An immunohistochemical score greater than 10 was considered a positive AR result . Positive controls included normal breast tissue surrounding the neoplastic lesion (for all antibodies) and normal prostatic tissue (for AR). Negative controls included the omission of primary antibodies. All the immunoreactions were separately evaluated by two senior pathologists . Data were analyzed using statistical package for the social sciences (SPSS, version 16; SPSS Inc., Chicago, Illinois, USA) program for Windows. Percentages and frequencies were used to report descriptive data of our categorical variables, whereas means, medians, and SD were used to summarize our continuous data. Overall survival (OS) was estimated from the date of diagnosis till the date of death or the date of last contact. Relapse-free survival was estimated from the date of diagnosis till the date of relapse, disease progression, death, or lost to follow-up, whichever earlier. Possible associations were tested for significance using Pearson's c2-test and Fisher's exact test, each when appropriate. Survival data were analyzed using Kaplan–Meier curve, and log-rank test was used to compare survival between groups. P less than 0.05 was considered significant. 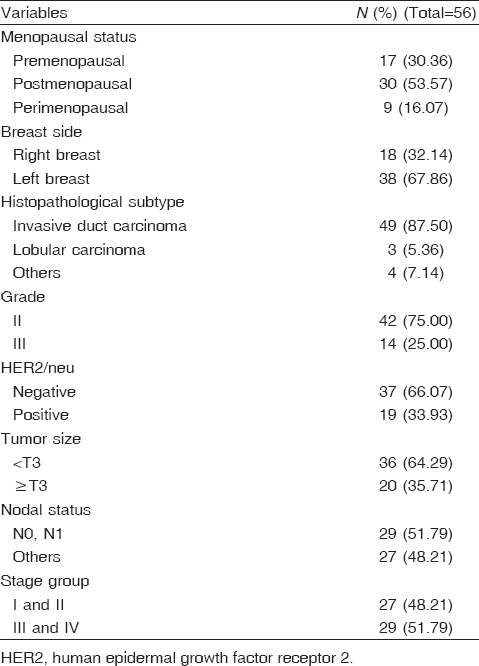 In this study, we included 56 patients with ER-negative breast cancer predominantly TNBC who presented to the Department of Clinical Oncology at Menoufia University between January 2012 and December 2014. Mean age for patients within our sample was 51.1 (SD = 11) years, ranging from 26 to 82 years. 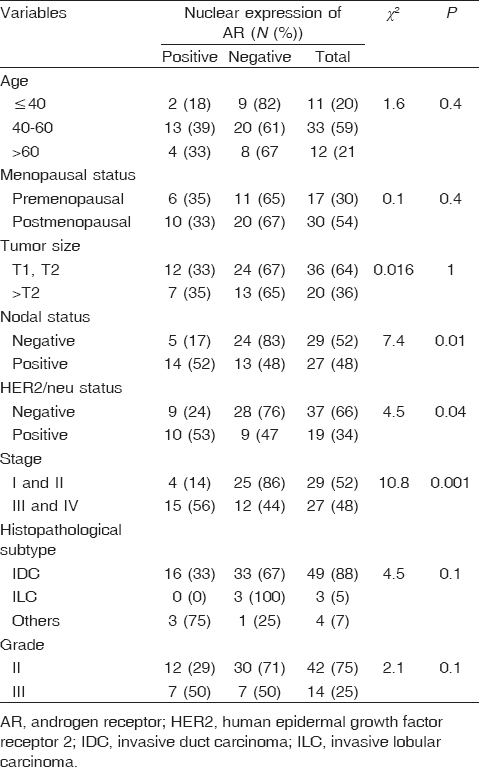 [Table 1] summarizes the descriptive data about the included patients, including menopausal status, side-effects of disease, tumor size, extent of nodal involvement, stage, grade, histopathological subtype, and HER2/neu status. Only 34% (n = 19) showed positive nuclear expression of AR, of which nine cases showed mild intensity of nuclear staining, whereas 10 showed moderate intensity. H-score ranged from 30 to 100, with a mean score of 65 (SD = 18). Percentage of stained nuclei ranged from 30 to 70%, with a mean percentage of 45% (SD = 13.2%). Subgroup analysis revealed that AR was more expressed in patients with HER2-positive disease (52%) than those with TNBC (24%) [Table 2]. Axillary lymph node (LN) metastases were present in 52% (n = 14/27) of the patients with AR-positive tumors compared with 48% (n = 13/27) of patients with AR-negative lesions. On the contrary, 5/29 (17%) patients with pN0 disease were AR-positive and 24/29 (83%) were AR-negative (P = 0.01) [Table 3]. Regarding AR immunoexpression and HER2 status, statistical analysis showed significant correlation with 53% (10/19) of HER2-positive breast cancer cases showing AR-positivity compared with only 24% (9/37) of TNBC types (P = 0.04). In the subgroup analysis of patients (n = 37) with TNBC, there was significant association between nuclear expression of AR and nodal status and stage group (P = 0.05 and 0.008, respectively) denoting that AR was associated with advanced nodal disease and disease stage. The median follow-up duration for our patients was 30 months. There was no significant effect of nuclear expression of AR on OS (P = 0.18) or progression-free survival (P = 0.957) [Figure 1] and [Figure 2]. Figure 1: Overall survival among androgen receptor (AR)-positive and AR-negative patients. Figure 2: Progression-free survival among androgen receptor (AR)-positive and AR-negative patients. In the subgroup analysis of patients with TNBC (37 cases), there was significant correlation between OS and nuclear expression of AR (P = 0.03) [Figure 3]. Figure 3: Overall survival among androgen receptor (AR)-positive and AR-negative patients among patients with triple-negative breast cancer. On the contrary, AR expression was correlated with better survival in patients with ER-negative HER2-positive breast cancer (P = 0.02) [Figure 4]. 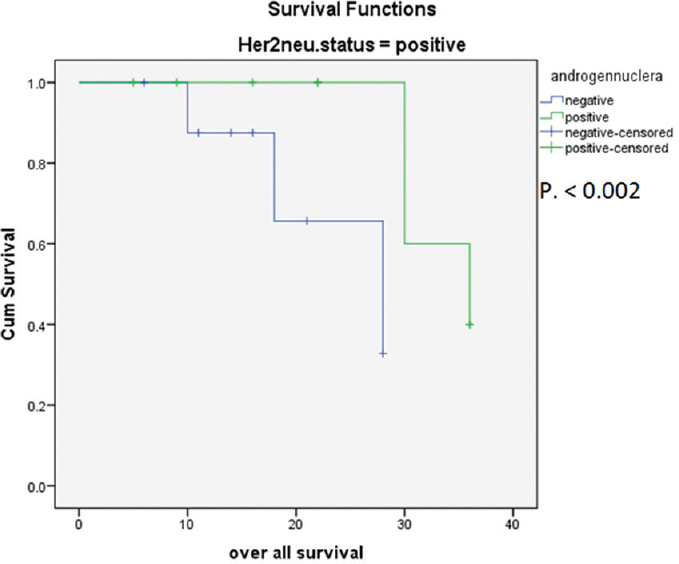 Figure 4: Overall survival among androgen receptor (AR)-positive and AR-negative patients among patients with HER2/neu overexpression. Breast cancer is one of the most common malignancies among women all over the world. It may be classified into five subtypes based on molecular cytology: luminal A, luminal B, normal breast-like, basal-like, and HER2 overexpressing tumors . Different subtypes require different therapeutic strategies. TNBCs are more aggressive and have a predilection for affecting younger women. These tumors are often larger and have more advanced histologic grade compared with ER-positive breast cancers. In view of their lack of hormone expression, there are no targeted therapies for TNBC and prognosis is not surprisingly poor . The AR is expressed ~ 70–80% of overall breast cancer cases. AR is also expressed in ductal carcinoma in situ DCIS, with 60–90% coexpression with ER. In TNBCs, the AR is expressed in 10–43% of cases . Consistent with these data, we found that AR was positive in 32% of patients with ER-negative breast cancer which is comparable with results reported by Hu et al. , McGhan et al. , and He et al. , who reported AR expression in 37, 23, and 26% cases, respectively. In Nurses' Health Study, 3093 breast cancers were enrolled in the study. Tissue microarray sections were immunostained for ER, PR, HER2, cytokeratin 5/6, epidermal growth factor receptor (EGFR), and AR. Patients were categorized as luminal A or B, HER2, and basal-like. The relationship between AR expression and molecular subtype was analyzed. Overall, 77% of the invasive breast carcinomas were AR-positive. The frequency of AR expression varied significantly across the molecular subtypes (P = 0.0001); only 32% of basal-like cancers expressed AR . Hu et al. conducted a prospective study that included 1467 postmenopausal patients. They found that among 1164 ER-positive cases, 88.0% were AR-positive, whereas among women with ER-negative tumors (303 cases), 42.9% were AR-positive. Moreover, 37% were AR-positive among TNBC cases . A systematic review and meta-analysis done by Vera-Badillo et al. reviewed 19 studies including 7693 patients and concluded that ER-positive tumors were more likely to express AR than ER-negative tumors were (74.8 vs. 31.8%, P= 0.001). Micello et al. reported higher percentage of AR in patients with ER-negative breast cancer at 56% (128/232 patients); they classified their patients based on cytokeratin expression into two groups, luminal-type breast cancers (44.2%) and basal-like-type breast cancers (55.8%), and into TNBC versus HER2-positive, according to HER2-positivity. Overall, they found AR-positivity in 56% of patients, but immune reactivity was reported in 31.2% basal-like breast cancers and 30.4% of TNBC . These results are apparently different from our results. We did not classify our patients according to cytokeratin expression, but among our patients with TNBC (37 patients), we found immunoreactivity in 26% of these patients, and in 52% of patients with ER-negative, HER2-positive the difference in the percentage of AR expression may be explained higher percentage of HER2-positive patients 40 versus 33% in our study. Also, the mean age was higher among their patients than our study (58 vs. 51 years). Moreover, they included a higher number of patients (232) and a higher concentration of antibody (1:20 vs. 1:50) than our study . On the contrary, Niemeier et al. reported AR reactivity was seen in 10% of triple-negative cases and 63% in ER-negative/PR-negative/HER2-positive cases. The low percentage of AR in TNBC may be attributed to low number of cases with TNBC (30 cases) . In view of these data, an interaction between AR and ER could be expected. The interplay between AR and ERα signaling in breast cancer was investigated by Peters et al. in their interesting both in-vitro and in-vivo study that included breast cancer cell lines and immunohistochemical study of 215 patients. They provided evidence that inhibition of breast cancer growth by androgens is mediated primarily through the AR by binding to estrogen-responsive element; the AR can prevent activation of target genes that mediate the stimulatory effects of estradiol on breast cancer cells . Regarding axillary nodal metastases, which represents a reliable prognostic factor in breast carcinoma, in this study, strong positive association between AR expression and LN metastases was found. Approximately half (51%) of patients with positive axillary LN metastases had nuclear AR-positivity versus only 17% in those with N0 disease (P = 0.007). This is in agreement with McGhan et al. , who examined 177 tissue cores obtained from 94 patients with TNBC. They found that 45% of patients expressing AR had positive axillary LNs, whereas 22% of patients who did not express AR were node positive (P = 0.03) . The same was reported by Micello et al. , who reported significant correlation between LN status and AR expression. Axillary LN metastases were present in 63.4% (52/82) of patients with AR-positive tumors compared with 36.6% (30/82) of those with AR-negative lesions (P = 0.034) ,. In contrast with these results, Narita et al. found a positive association between AR expression and LN-negative carcinomas. This may be related to heterogeneity of tumor cell type among their patients as they included all breast cancer subtypes . On the contrary, He et al. reported that AR negativity was associated with higher incidence of axillary nodal metastases in TNBC. They included patients with early TNBC and excluded patients with stage IV or locally advanced disease. Zakaria et al. also found that AR expression in TNBC was correlated with negative axillary LNs. They included 77 patients with predominantly early-stage disease (54/77), with no patients in stage IV . Niemeier et al. found that in ER-negative patients, 31% of patients with AR-negative disease showed LN metastases, whereas none of the eight cases with AR immunoreactivity showed LN metastases (P = 0.15). However, in ER-positive patients, 71% of patients with AR-negative disease showed LN metastases, whereas 34% of patients with AR reactivity had axillary LN-positive disease, but it was statistically insignificant (P = 0.09) . An interesting finding of our study was the significant correlation between AR expression and HER2 overexpression. Among 19 patients with HER2/neu overexpression, we found coexpression of AR in 10 patients. The mean H-score was 41 in HER2-positive group and 18 in TNBC. This result is in agreement with the observations of Micello et al. who reported that AR is frequently expressed in HER2-positive, ER/PR-negative breast cancers. They found that 76.7% (69/90) of HER2-positive BC cases were AR-positive compared with only 30.4% (41/135) of TNBC types (P = 0.001) . These data suggest that AR can be involved in the pathogenesis of breast carcinomas, indicating that HER2/neu may control the transcriptional activity of AR. The interaction of AR with the HER2/neu-related pathway has been investigated in human prostate cancer cell lines, suggesting a cross-talk between AR and HER2/neu pathway and demonstrating that HER2/neu induces AR transactivation through the MAP kinase pathway. These findings have potential clinical relevance as antiandrogens do not inhibit AR in the presence of HER2/neu . There is a disagreement about the prognostic significance of AR expression. Regarding OS, we found no statistically significant correlation between AR expression and OS in whole patient group. In a subset of patients with TNBC, the correlation between AR expression and OS was statistically significant (P = 0.03). Therefore AR is considered as a poor prognostic factor among patients with TNBC. On the contrary, AR expression was found to correlate with better survival in patients who are ER-negative and HER2-positive (P = 0.02). The contradicting role in both subgroups abolishes the effect on the whole patient group and enforces the concept of breast cancer heterogeneity among different molecular subtypes and the need to tailor treatment to each subtype. Hu et al. in their unique large prospective study with median follow-up of 14 years observed that women with AR-positive tumors had a longer survival rate than women with AR-negative tumors. The estimated 5- and 10-year breast cancer-specific survival rates were 88 and 82%, respectively, among women with AR-negative tumor rates were 95 and 88%, respectively, among women with AR-positive tumors. Women with AR-positive/ER-positive tumors had the best survival relative to women with the other subtypes (P = 0.0004), and women with AR-positive/ER-positive tumors had significantly better breast cancer-specific survival than in women with AR-negative/ER-positive tumors (P = 0.003). In contrast, among women with ER-negative tumors, no significant association was found between AR status and breast cancer-specific survival. They also reported that women with AR-positive TNBCs (211 cases) had an 83% increase in overall mortality compared with women with AR-negative tumors (multivariate hazard ratio: 1.83, 95% confidence interval: 1.11–3.01, P= 0.02) . He et al. found that AR expression was a favorable prognostic factor of disease-free survival (DFS) and OS; this may be explained by homogeneity of their patients (TNBC), larger number of patients (286), and longer follow-up, with median follow-up time of 72 months (range: 8–182 months) . Luo et al. found that AR expression was correlated better with 5-year DFS and OS among patients with TNBC, but it was not correlated with the 5-year DFS and OS among patients without TNBC. The non-TNBC group in this study (132 patients) included both ER-positive and ER-negative patients . In conclusion, our study suggests that TNBC may be further subdivided into two subtypes according to AR status. AR expression may be a poor predictor of TNBC outcomes. AR-targeted therapy may be a possible therapeutic option that can help improve survival for the evidence. Zhou X, Wang S, Wang Z, Feng X, Liu P, Lv X-B, et al. Estrogen regulates Hippo signaling via GPER in breast cancer. J Clin Invest 2015; 125:2123–2135. Yu Q, Niu Y, Liu N, Zhang J, Liu T, Zhang R, et al. Expression of androgen receptor in breast cancer and its significance as a prognostic factor. Ann Oncol 2011; 22:1288–1294. Whelan TJ, Pignol J-P, Levine MN, Julian JA, MacKenzie R, Parpia S, et al. Long-term results of hypofractionated radiation therapy for breast cancer. New Eng J Med 2010; 362:513–520. Thiagalingam S. Currentstate of the evolving MMMN cancer progression models of cancer. Syst Biol Cancer 2015; 9:345. Lim E, Ni M, Hazra A, Tamimi R, Brown M. Elucidating the role of androgen receptor in breast cancer. Clin Invest 2012; 2:1003–1011. Sismondi P, D'Alonzo M, Bounous VE, Quintili F, Ferrero AM, Mariani L, et al. Androgenreceptor and breast cancer. In: editor. Frontiers in gynecological endocrinology. Switzerland: Springer; 2015. pp. 179–183. Collins LC, Cole KS, Marotti JD, Hu R, Schnitt SJ, Tamimi RM. Androgen receptor expression in breast cancer in relation to molecular phenotype: results from the Nurses' Health Study. Mod Pathol 2011; 24:924–931. Ren Q, Zhang L, Ruoff R, Ha S, Wang J, Jain S, et al. Expression of androgen receptor and its phosphorylated forms in breast cancer progression. Cancer 2013; 119:2532–2540. Kirkegaard T, Edwards J, Tovey S, McGlynn L, Krishna S, Mukherjee R, et al. Observer variation in immunohistochemical analysis of protein expression, time for a change? Histopathology 2006; 48:787–794. Qu Q, Mao Y, Fei XC, Shen KW. The impact of androgen receptor expression on breast cancer survival: a retrospective study and meta-analysis. PLoS One. 2013; 8:e82650. Balani S, Katiyar S. Understandingtriple negative breast cancer. WebmedCentral CANCER 2015; 6:WMC004895. IGucalp A, Traina TA. Triple-negative breast cancer: role of the androgen receptor. Cancer J 2010; 16:62–65. Hu R, Dawood S, Holmes MD, Collins LC, Schnitt SJ, Cole K, et al. 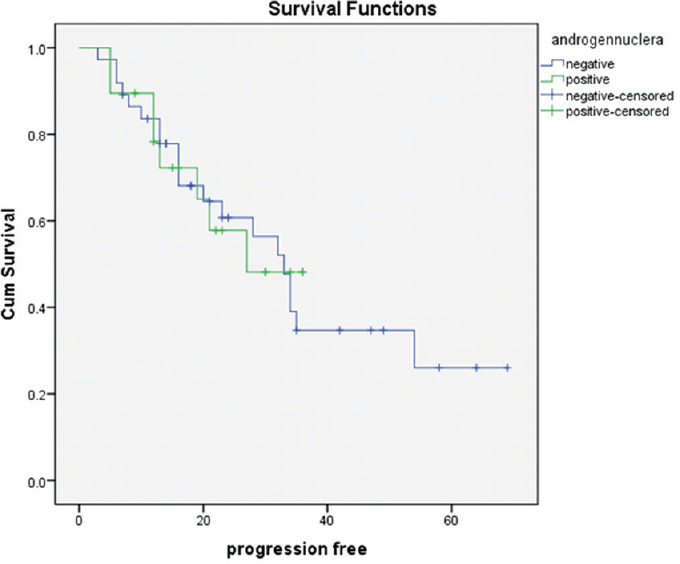 Androgen receptor expression and breast cancer survival in postmenopausal women. Clin Cancer Res 2011; 17:1867–1874. McGhan LJ, McCullough AE, Protheroe CA, Dueck AC, Lee JJ, Nunez-Nateras R, et al. Androgen receptor-positive triple negative breast cancer: a unique breast cancer subtype. Ann Surg Oncol 2014; 21:361–367. He J, Peng R, Yuan Z, Wang S, Peng J, Lin G, et al. Prognostic value of androgen receptor expression in operable triple-negative breast cancer: a retrospective analysis based on a tissue microarray. Med Oncol 2012; 29:406–410. Vera-Badillo FE, Templeton AJ, de Gouveia P, Diaz-Padilla I, Bedard PL, Al-Mubarak M, et al. Androgen receptor expression and outcomes in early breast cancer: a systematic review and meta-analysis. J Natl Cancer Inst 2013; 106:djt319. Micello D, Marando A, Sahnane N, Riva C, Capella C, Sessa F. Androgen receptor is frequently expressed in HER2-positive, ER/PR-negative breast cancers. Virchows Arch 2010; 457:467–476. Niemeier LA, Dabbs DJ, Beriwal S, Striebel JM, Bhargava R. Androgen receptor in breast cancer: expression in estrogen receptor-positive tumors and in estrogen receptor-negative tumors with apocrine differentiation. Mod Pathol 2010; 23:205–212. Peters AA, Buchanan G, Ricciardelli C, Bianco-Miotto T, Centenera MM, Harris JM, et al. Androgen receptor inhibits estrogen receptor-α activity and is prognostic in breast cancer. Cancer Res 2009; 69:6131–6140. Narita D, Raica M, Suciu C, CĂŽmpean A, Anghel A. Immunohistochemical expression of androgen receptor and prostate-specific antigen in breast cancer. Folia Histochemica Cytobiol 2006; 44:165–172. Zakaria F, El-Mashad N, Mohamed D. Androgen receptor expression as a prognostic and predictive marker in triple-negative breast cancer patients. Alex J Med 2015; 52:131–140. Meng TC, Lee MS, Lin MF. Interaction between protein tyrosine phosphatase and protein tyrosine kinase is involved in androgen-promoted growth of human prostate cancer cells. Oncogene 2000; 19:2664–2677. 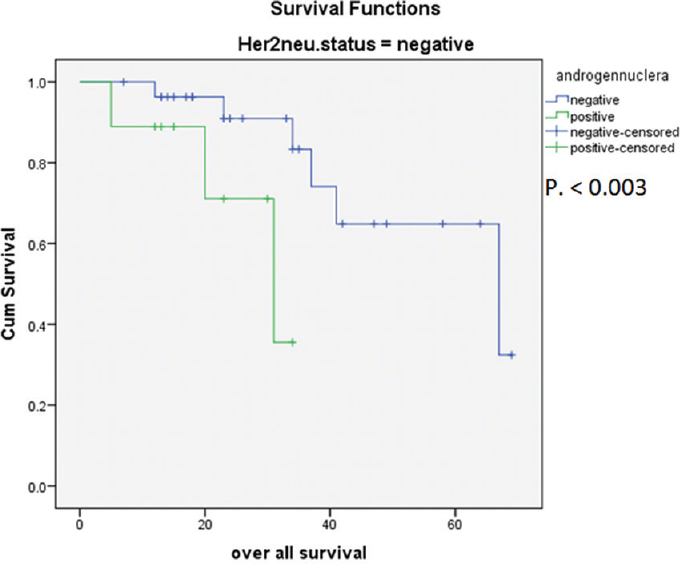 Luo X, Shi Y, Li Z, Jiang W. Expression and clinical significance of androgen receptor in triple negative breast cancer. Chin J Cancer 2010; 29:585–590.